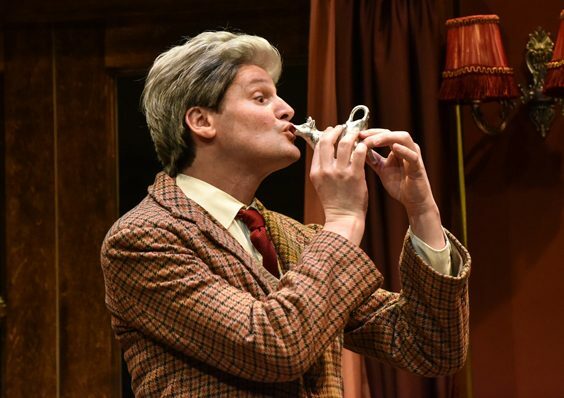 The spirit of PG Wodehouse’s finest creations was alive and well at York Theatre Royal, as the touring Lakes Season drew to a roaring finale with Perfect Nonsense, a play by brothers Robert and David Goodale that was first performed in 2013. With the backing of the Wodehouse estate, the siblings have come up with the ideal scenario in which to carry on the Jeeves and Wooster canon, while staying faithful to the deeds and spirit of the originals. Perfect Nonsense is based on the novel The Code of the Woosters, which epitomises the japes and scrapes that the lovable Bertie finds himself in on all too many occasions. This time, he is despatched to Totleigh Towers to steal a silver cow creamer for his uncle, as one does, while simultaneously trying to prevent the relationship between the dim-witted Madeleine Bassett and the even dimmer-witted Gussy Fink-Nottle from being rendered asunder. Such an event, of course, would then see Bertie’s largely idyllic bachelor life ended as next in line to the Bassett hand in marriage. Sadly, being such an oaf as Bertie, all, in fact very little, goes to plan. But who needs it to when the inimitable Jeeves is on hand to save the day? The genius of the Goodales’ play is that there are many characters, but only three actors; two of them playing any number of roles as they try to recreate the sequence of events for Wooster, in his new role as host of a one-man stage show that he hasn’t quite thought through. Once again Jeeves is prepared for every eventuality, along with his fellow valet Seppings and, not really a spoiler alert, but all’s well that ends well. Having seen Single Spies earlier in the week, starring Thomas Richardson, Theo Fraser Steele and James Duke in far more serious roles, this was a wonderful opportunity to see them so soon after in a production of pure high farce. 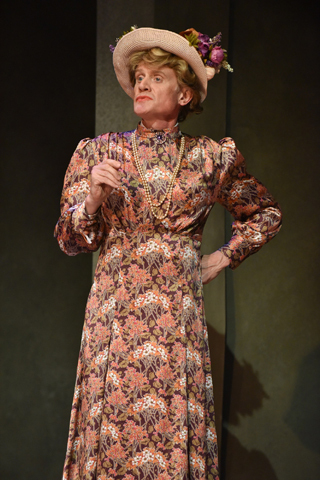 For Duke to go from playing Anthony Blunt to seeing him dressed in drag as the fearsome Aunt Dahlia, among others, was a real treat, while Steele followed his superb performance as Guy Burgess in the former with a first-class Jeeves here, not to mention his show-stopping scene in which he manages to simultaneously hold a conversation with himself while playing two very different characters. Richardson is excellent as Wooster, trying his best to narrate the story while dashing here, there and everywhere to avoid his potentially devastating fate, finding just the right balance between foolish clot and lovable clown. Quite honestly, the cast have been quite fantastic in all of their roles during this short season of plays.